If you have read my suggested itineraries for travelling in Austria, you might have ended up with this article because of my recommendation to leave Vienna if you are staying for three days or longer. There are several day-trip destinations within reach. Here it comes in handy that public transportation is heavily subsidised in Austria, since excursions even to more distant parts of the country are quite feasible. The following list of recommended day-trips is arranged by effort that it takes getting there and by appeal. If any destination is hard to get to, I have stated it separately. For all others, train and bus connections are good and frequent and you will not need to rent a car. Note that public transportation is best on weekdays and might be less frequent on Sundays. 1.) Klosterneuburg: 10 minutes on the train and you are there - the town is literally on the doorstep of Vienna and offers a massive monastery, nice Heurige wine bars, insights into Austria′s rural life and one of the country′s finest collections of contemporary art. Spend half a day or a day. 2.) Laxenburg: The playground of several generations of Habsburgs. Originally a 15th century castle, it later turned into country retreat with Baroque pleasure grounds. Easy access and a great place for a picnic. 3.) Mödling: Easy access to hiking routes in the Vienna woods, an alright town centre and references to Ludwig van Beethoven and Arnold Schoenberg. 1.) Baden: A spa-town with a famous casino, nice parks and good access to the Vienna woods. A tad too posh to teach you much about rural Austria, but attractive for its Biedermeier heritage. Interesting museums finish the job. 2.) Tulln: A pretty town by the Danube, birthplace of Egon Schiele and home to sights from a range of periods. From Roman days to present. 3.) Krems: One of the prettiest towns in one of the prettiest areas of Austria (the Wachau). Medieval lanes, ancient burgher houses, wine culture and - you guessed it - thousands and thousands of tourists. 4.) Carnuntum: Under Roman rule, this town was the biggest city in the province of Pannonia - today, it has lots of archaeological excavations to offer. Plenty of good wine here, too. Recommended to those with an interest in antiquity. 5.) Melk: The Benedictine monastery of Melk is quite certainly the most impressive one in a country full of impressive monasteries. An excessive concentration of Baroque art - and tourists, especially in the summer. 6.) Wiener Neustadt & the Semmering: The biggest city of Lower Austria isn′t really that exciting, but it does make a good stop-over destination if you want to catch a glimpse of Austria′s alps by taking a train through the scenic Semmering Mountain Range. 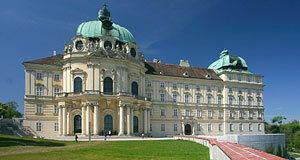 Continue with "Day-Trips from Vienna - Part II"